Tomorrow marks the two week birthday of Uncle Dee Dee, also known as Josephine. The boys have taken to the transition brilliantly. Apart from being just a little more whiny than usual they have really embraced their new sister. Martin just is a little clingy and Elliott thinks it is hilarious to pee in his pants. He only does it at home for peak humor value. He knows that out in public it wouldn't be anywhere near as funny. When we got home we were greeted with a lovely welcome for the baby. The baby even had the foresight to pick up some gifts for the boys. Sadly she didn't have the foresight to buy two swords of the same color and now her brothers ruthlessly fight over the blue and red sword and try to give the nasty "Green goblin" sword to the other one. Also, they have linked these toys together and think that football is played by someone tossing them the football from the grass as they stand on the deck and swing at it with their swords. I think their idea of football is way better than the way it's normally played. The boys also had a fun time feeding their babies with Mummy. Dee Dee has eaten from a bottle about three times so far and Elliott was fortunate enough to be one of the lucky people that got a chance to feed her. Like most things with the baby I think one time will be enough and then he'll get bored and move on to other things. Martin has done the bulk of the holding and snuggling. Every time she moved a quarter of an inch he pats her head and says, "Okay, okay. Martin's here." With beautiful weather the boys have gone nuts in the backyard, mostly dueling all over the landscape just like Westley and Inigo though who is who is often under debate. During nap time I've had a chance to snuggle Josephine while I monkey around in the studio, or sometimes I've put her in her Rock and Play in a tight swaddle so she gets a really good sleep in. 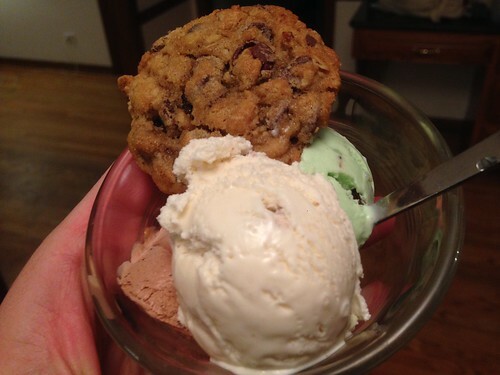 Late nights, after the boys are in bed, we've been enjoying some of our plentiful supply of Oberweiss ice cream and homemade cookies as Jen give her a last feed, I change her, then we try to get some sleep. She's been doing really well. She wakes up ever 2-3 hours but eats with little incident and goes back to sleep pretty easily. On Friday Jen was feeling healed enough to go for a little walk to check out a neighborhood garage sale. Since we got there later than 9am on the first day of the sale most of the good stuff had been taken but it was great to get out and about. So far Dee Dee has gotten more sunshine in her first two weeks of life than the boys did in their first year. Later on Saturday, after an epic no-nap meltdown, we did our annual tradition of pretending to care about the Kentucky Derby. We thought the boys would think it was fun to watch the horses. We were wrong. Martin brought out his rocking horse for a minute so I thought he'd be all excited and ride it for the duration of the ten minutes that we chose to watch. This lasted about thirty seconds and then he was off to color in the other room. Elliott stayed on the deck the whole time drawing with chalk. He drew this picture of Iceman. I thought it showed some pretty good control as he drew a head, neck, two eyes, and even pupils in the same eyes. I have no idea at what level children develop artistic abilities or can interpret things but to me it seemed pretty impressive. Perhaps that is just because of my lack of artistic skills. It was Elliott's turn to go grocery shopping with me on Saturday. I let him pick a treat and he picked cookies. Much like Martin the week before with cupcakes (or pupcakes, as he calls them) he held onto his single cookie with the love and nurturing touch of a mother holding a newborn. Outside we saw a firetruck and he was psyched to go up to it. When the fireman came out to say hi and ask him if he wanted to sit in the driver's seat he got a little shy and refused. It was a missed opportunity. It was only the shame that society has taught me to have over the course of my life that prevented me from asking if it would be okay if I sat in the seat. On Sunday we went to the Green Earth Institute, down the road, and they got to pet chickens. All day they were asking me if they could see a polar bear at the zoo. I'd tell them that we were going to a farm, not a zoo, and that there probably wouldn't be any polar bears. Then they'd ask me if we were going to see a sea lion or a rhino. After thirteen days of being at home, being the responsible parents that we are, we thought maybe it would be time to give Dee Dee her first bath. The thing I forgot about babies is that they can go a seemingly infinite amount of time without a bath and still feel and smell fresh. It's easy to forget that when you have two rampaging toddlers who become sweaty, sticky, and stinky in the time it takes them to get from the bath to their bedroom, twelve paces away. Going back to work will complicate things. Dee Dee sleeping less than twenty-one hours a day will complicate things further. But for now we'll enjoy the hectic but enjoyable life of having three children under three. We're going to pay for this soon. Just catching up on your blog. CONGRATULATIONS on the birth of baby Josephine! !